Until recently, a drive over the Eau Gallie Causeway in Melbourne, Florida would find you gazing upon a mystical green dragon guarding the southern tip of Merritt Island. 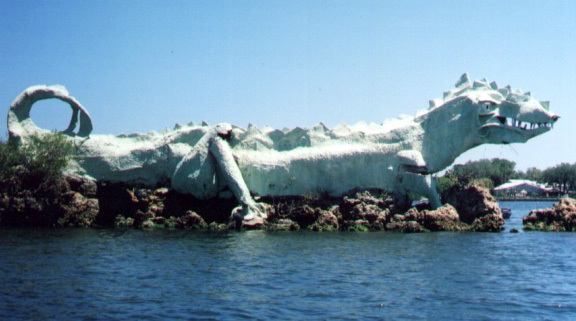 The 35-foot tall, 65-foot long dragon was crafted of 20 tons of concrete and steel in 1971. As the Florida Today newspaper reports*, the massive sculpture embodied a legend of peaceful Indian tribes who long ago inhabited Merritt Island and sailed the Intracoastal Waterway. Legend has it that a witch doctor conjured a dragon to protect his people from enemy tribes on the mainland. If the dragon was sighted rising out of the mist where the Banana and Indian rivers met, it signaled good fortune. Hence, the name, Dragon Point. It is said the spirit of the dragon still protects the people who live on the island. Dragon Point served as a Brevard County landmark and icon for more than 30 years. In turn, as a company, we at DragonPoint work to bring good fortune and protection to the information assets of our clients. We strive to be an icon in the industry, and we will remain a steadfast landmark as we serve our client’s needs throughout the coming decades.